GH3D-388 | Size: 15 ml / 0.51 fl. oz. 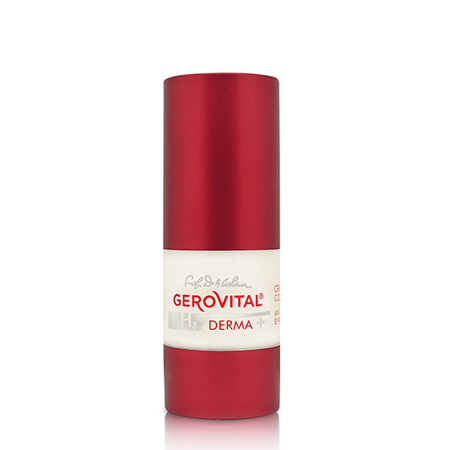 Visibly reduces fine lines and wrinkles and instantly brightens and refreshes the delicate eye area. The cream is especially formulated to deliver long-term skincare benefits to the eye area. Enriched with active principles ensures a triple synergistic action upon the eye area: reduces deep wrinkles, smooths expression wrinkles and fades dark circles. Matrixyl® synthe’6® - increases the density and firmness of the dermis, fills in wrinkles from the inside both on the forehead and the crow’s feet for a visibly smoother and plumper skin. Stimulates major constituents of the skin matrix and the dermal–epidermal junction (DEJ) and ensures an optimal architecture of the tissue. Sepilift™ DPHP – protects and reinforces skin structure, having a triple firming action: it stimulates remodeling and contraction of collagen fibers, protects elastic fibers against enzymatic breakdown and scavenges free radicals. Shea Butter and Squalane - deeply regenerate and nourish the skin, compensating the deficit of lipids in the eye area. Have antioxidant and immune-stimulating properties, offer a revitalizing effect and prevent skin aging by protecting it against the destructive action of the free radicals. Aquaxyl - moisturizes and restructures the skin by increasing the content of Hyaluronic Acid. Prevents dehydration by stimulating the production of ceramides and the synthesis of proteins. Improves skin’s micro-relief and reduces fine lines. Vitamins A (“skin normalizer”) and E (“skin protector”) - help blocking the oxidative reactions and destructive processes caused by them. Normalize keratinization (horny layers) by regulating skin cell growth and differentiation. Gatuline® Expression Extract - efficiently fights against the appearance of expression lines (fine lines) and visibly smooths the skin’s surface. Haloxyl® – reinforces firmness and tones the eye area. Has concealing effect fading dark circles color and treats local inflammation. Apply in the morning and in the evening after cleansing, along the contours of the eyes in gentle patting motions. Apply in the morning and in the evening after cleansing, along the contours of the eyes in gentle patting motions. Use either by itself or after your usual serum. INGREDIENTS: AQUA, CETEARYL GLUCOSIDE, CETEARYL ALCOHOL, SUCROSE POLYSTEARATE, HYDROGENATED POLYISOBUTENE, SQUALANE, CAPRYLIC CAPRIC TRIGLYCERIDE, GLYCERIN, HYDROXYPROPYL CYCLODEXTRIN, PALMITOYL TRIPEPTIDE-38, XYLITYLGLUCOSIDE, ANHYDROXYLITOL, DIPALMITOYL HYDROXYPROLINE, GLYCERYL STEARATE, PHENOXYETHANOL, ETHYLHEXYLGLYCERIN, SODIUMPOLYACRYLATE, HYDROGENATED POLYDECENE, TRIDECETH-6, BUTYROSPERMUM PARKII BUTTER, TOCOPHERYL ACETATE, ALCOHOL, ACMELLA OLERACEA EXTRACT, STEARETH-20, N-HYDROXYSUCCINIMIDE, CHRYSIN, PALMITOYL OLIGOPEPTIDE, PALMITOYL TETRAPEPTIDE-7, RETINYL PALMITATE, HELIANTHUS ANNUUS(SUNFLOWER) SEED OIL, BHT, PARFUM, TETRASODIUM EDTA, SODIUM HYDROXIDE, BHA. Offers a face contour remodeling effect.